Grains are good for you. Grain foods are the foods we love that love us back. All grain foods contribute less than 15% of all calories in the total diet, while delivering greater than 20% of three shortfall nutrients – dietary fiber, folate, and iron – and greater than 10% of calcium, magnesium, and vitamin A. Fiber is our friend. According to the National Health and Nutrition Examination Survey Data, grains and grain-based foods provide 40% of fiber in the American diet. Ditch the fad diet but keep the grains. Bread is dietitian approved – grains are a part of every healthful eating plan, like the Mediterranean diet, and as part of a healthy diet, provide nutrients needed for healthy aging: B-vitamins, magnesium, selenium, iron, folate, and fiber. Make sure your grains keep healthy company. The ingredients inside the sandwich – not the bread – are the leading contributors of calories, fat and sodium. 1. Brush bread slices with olive oil. Sprinkle lightly with salt and pepper. Broil until lightly browned. 2. 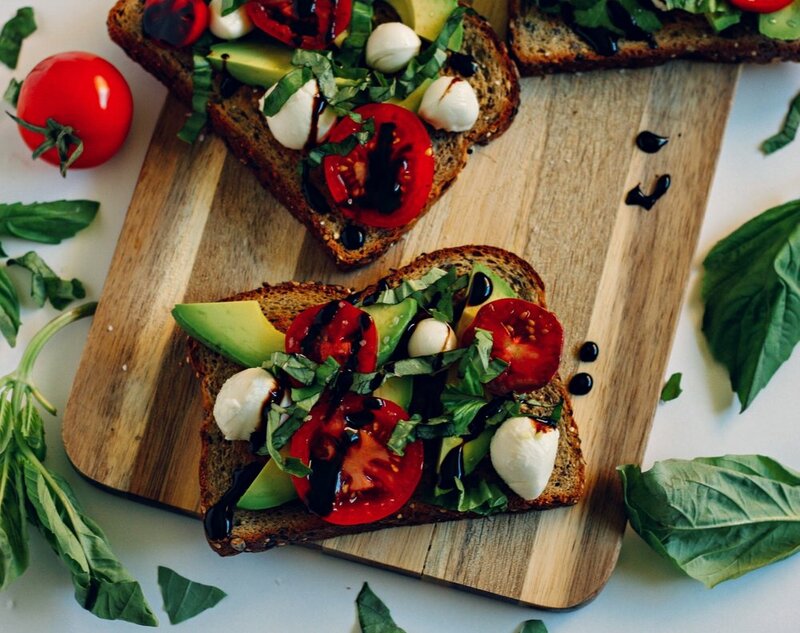 Lay out the 8 slices of bread, and top each with avocado, tomato, bocconcini, and basil. 3. Drizzle with balsamic glaze. Beef and Mushroom Burgers – with the benefits of the bun! 1. Combine ground beef, mushrooms, egg white, garlic, salt and pepper in large bowl, mixing lightly but thoroughly. Lightly shape into four 1/2-inch thick patties. 2. Place patties on grid over medium, ash-covered coals. Grill, covered, 8 to 10 minutes (over medium heat on preheated gas grill, covered, 7 to 9 minutes) until instant-read thermometer inserted horizontally into center registers 160°F, turning occasionally. 3. Place burgers on bun bottoms. Top evenly with cheese. Close sandwich. Shari Steinbach is a registered Dietician and Nutrition & Culinary Consultant. Shari has managed consumer health communication, community events, nutrition programs, and solution-selling strategies.